He always refers to Good Smile Company as ‘Good-san’ even though most of us rather shorten to it ‘Good Smile’. It reminded me of how some people call McDonalds, ‘McDs’ and others call it ‘Macs’ here in Japan. Does anyone else refer to Good Smile as Good-san… or anything else? She is the fickle owner of the antique shop from the popular PSP game ‘Shining Hearts’. The pose is based on a key visual from the game where Xiao-Mei has a beautiful smile across her face and a slightly tilted face. If you include all the figures from Shining Tears and Shining Wind…. 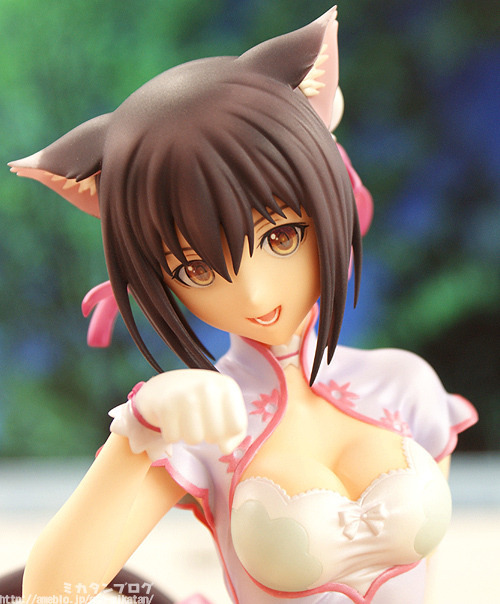 this is the 11th figure to join Max Factory’s ‘Shining’ figure series! Those legs are the legs that all girls want!! The tilted head just makes her cuter! Even her outfit is adorable!! It kind of looks like a ‘naked apron’ from this angle… I really like how it looks! It taunts you into thinking you can see underneath but you just can’t! Now you can see a little better! …of course she’s wearing some… but if you wanna get a closer look than that you’ll have to take a look with your your own eyes!! Her bosom is impressive too! The skin looks so smooth and the clothes give a very ‘tight fit’ feeling… it really lets Xiao-Mei boast her body!! By the way… this figure is actually sculpted by a girl! Her thighs are stunning, but also take note of the sash! You can peek from below to get a good look at them like this! It’s areas like this that you could never see in the the illustration… and now not only can you see it but you can touch it too!! She’ll be on the GSC site by mid-March! For preordering details or questions check out our partner shops.